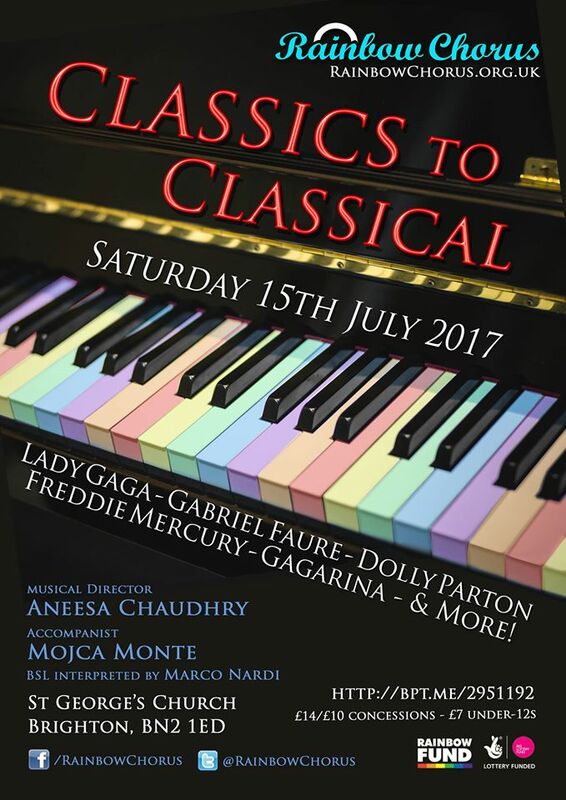 For one night only on Saturday 15th July the Rainbow Chorus are pushing all the boundaries with their summer production Classics to Classical challenging their audience with a whole spectrum of music from Faure to Freddie Mercury. This unique production showcases the wide range of talent in this increasingly diverse choir. There is something for everyone to enjoy in this show of two halves so be prepared to be thrilled, excited and moved by the range of music and emotions the Rainbows have in store. You will be transported through the beautiful and moving Faure’s Requiem performed in the iconic St George’s Church Kemptown- a real treat for everyone especially those not familiar with the work. Faure created a new kind of church music using dynamic harmony and colour and this will be complimented with fabulous classic numbers sung like youve never seen or heard before. Featuring songs from Gaga to Gagarina this production promises to be another Rainbow hit. They will be performing old classics from Lady Gaga to Queen/David Bowie, plus material from Antony and the Johnsons and even a Russian Eurovision entry! The wonderful Marco Nardi will provide BSL interpretation reaching out to the deaf community and adding a different dimension to the performance. The Rainbow Chorus, directed by the accomplished musical team of Aneesa Chaudhry and accompanist Mojca Monte, is the longest running Lesbian, Gay, Bisexual and Transgender (LGBT) choir in the South outside of London. It provides an enjoyable and supportive environment for LGBT+ members to sing together, make new friends, while developing their community spirit, individual talents and confidence. Through performance, the Chorus also raises the profile of the LGBT+ community in Brighton & Hove as well as providing first class entertainment. The Rainbow Chorus is often the chosen choir to perform at community events such as IDAHOBIT and Transgender Day of Remembrance and is proud to be supported by grants from the Big Lottery and the Rainbow Fund. So if you are feeling Under Pressure and in need of a break from the Nine to Five this is the show for you. Come and let the Rainbow Chorus entertain you in its own inimitable fashion!